For the past two years, I’ve chosen a word to be my focus for the year. In 2015, it was enjoy. 2016 was brave – and what a good one it was! I got married to my best friend, moved to three cities, embraced my calling at a dream job, and traveled internationally for the first time. D I S C I P L I N E. Seriously? Although I’m a pretty responsible person, I’m hardly a disciplined one. One area I notice this the most is in my health. I’ve always been the kid that hates physical activity. Gym was my NIGHTMARE throughout school. I was also the kid who loved junk food, fast food, and gagged almost at the mere sight of veggies. I still have that stubborn kid in me – the one that often chooses what’s easy over what’s best for me. In too many areas of my life, I choose what I want in the moment instead of what I want the most. This year, I want to do hard things. I want to embrace healthy habits, prioritize the important over the urgent, and learn to love daily discipline. I know it certainly won’t be easy, but I am encouraged by Hebrew 12:1-11 MSG. So this year, I’ll be disciplined knowing that my God is a loving Father who is doing what’s best for me, even when I can’t see it. Here’s to 2017, friends! Hi, friends! If you would have told me a year ago what I would be doing today, I would have straight laughed at you. Jesus is crazy, y’all. I never in a million years saw myself as a leader nor a pastor. But I’ve been realizing lately that most of the people we learn about in the Bible wouldn’t have exactly been number one draft pick either, and that comforts me. This year, I chose the word “Brave” to be my theme, and man, it’s been quite the adventure. I graduated college, got a new job, moved to a new city and got married – go big or go home, right? And I think what I’m learning from these changes is that being brave has a lot to do with living and leading through uncertainty. I actually hate uncertainty. I love planning things. I’m not a spontaneous person at all – in fact, I’m on of the most cautious people you’ll ever meet. But I think the problem is that in all my planning, I become addicted to controlling. And you don’t get to control your life and follow Jesus. It just won’t work, and it’ll make you sick and stressed along the way. Trust me. I’m learning that there’s a level of freedom in uncertainty, as impractical as it sounds. When we get to a place where we don’t know the answer, we get to seek the One who knows them all. My favorite example of leading in uncertainty comes from the book of Joshua. See, I relate a lot to Joshua. He was Moses’s apprentice, so the bar was already incredibly high. Everyone loved Moses, and now Joshua has to follow that example. To top it off, Moses lead Joshua and their people through seasons of wandering. All of Joshua’s leadership lessons involved learning about how to wander, how to survive, etc. But then, it was Joshua’s turn to lead the people. And at the same time, the season of wandering was gone. It was time to enter the promise land and face who knows what. Wandering was over – planting was now. I imagine Joshua, terrified. Then I imagine God answering that fear with the best, most reassuring Truth. In the very next verse, we see Joshua command the people that in three days, they will cross the Jordan River and enter the land they were promised. Joshua still doesn’t know what to do or how to do it. God didn’t give him the answers, and Moses didn’t teach him how to lead through it. But Joshua knows what they need to do, and he knows God is with him through it all. He led the people. He didn’t know what would happen, but He knew there was a God with them through every step. So my challenge is to lead through uncertainty. Life is uncertain. But we get a choice. We can be so afraid of being wrong that we stay wandering, or we can trust that God has given us everything we need to get to His promised plans. So be brave, friend. Choose to face your fear knowing that you may not know the outcome, but you know the God who will be with you always. I haven’t posted in forever, but I would just like to warn you that when you ask God to make you brave, He will definitely take you up on that. This year, I graduated college, started a new job and in just 25 days, I get to marry my best friend! And I am so excited about all these things because God is doing far more than I could ever ask or imagine. But as I’m counting down the days , I wonder why so much of our lives are filled with the “can’t wait” moments instead of the present ones. We all can’t wait to graduate, to get married, to get a job, to be an adult, to have kids, etc. And those are all crazy wonderful things. But I think too often, we view our lives in the big events instead of the everyday ones. We say things like “It’s almost Friday” or “I can’t wait for xyz.” Or “I’ll be happy when I (insert whatever. )” And that’s not always a bad thing. But I wonder what our lives would look like if we focused more on the reality of today instead of the expectation of tomorrow. What would happen if we didn’t waste our waiting seasons? Too often, we just sit around waiting for life to happen, when it’s happening right in front of our faces. We wait for the weekend while the weekdays slip by unnoticed. We numb ourselves to the beauty of today by dreaming of a greener, unpromised tomorrow. We think about the future, but we never do something to make the present the gift that it is. I don’t mean that you shouldn’t get excited about things or that you shouldn’t have goals or dreams. I believe God made us to grow, to learn and to seek more of life and more of Him. But I also think that we get so worried about making a leap for humanity when we should start taking steps to make our daily reality better. A lot of us view life as a timeline that we all accept. You’re “supposed to” get married or have kids or do whatever else it is that everyone else does, and when you check off the list, you’ve lived a good life. But I don’t think that’s right. I pray that I don’t get so caught up in the milestones that I miss out on the memories. I want to wake up and look forward to the day ahead, knowing that God created it to be lived to the fullest. I love the way that Shauna Niequest explains it. Your life is the good parts and the messy parts and the parts you screwed up. But we treat it like some monotonous, boring routine we show up for each day. I think you have choice every day whether to waste your waiting or relish in it. You can reserve your joy for the momentous occasions, or you can find reasons to seek joy in the day. You can be intentional while you wait, knowing that time is inevitable but joy is optional. I pray that I choose to truly live life, not just in the happy moments. Not just in the big moments. Not just in the moments I’m proud of or in the moments where others might be proud of me. I pray that that I recognize life is all the moments – the good, the bad, the ugly all rolled into one. It’s a collage of car breakdowns and birthdays, road trips and reading, adventuring and waiting. And all of it is to be lived because to not do so would be to insult the Maker of it all. If you know me, you know that one of my most favorite things in the world is leading 2-year-olds at LifeKids on Sundays. And even though 2-year-olds get a terrible reputation, they are seriously the cutest kiddos you ever did meet. What I love the most about these little ones, though, is how much they teach me about Jesus. My sweet little toddlers are fiercely independent, and they love figuring out how to do things for themselves. They love putting on their own socks and shoes, even though it takes them five minutes of struggling when I could help them in about five seconds. It makes you laugh sometimes, these little tiny people refusing your help. And I start to wonder…am I like this? And most of the time, the answer is yes. I’m fiercely independent, (which is basically a nicer way of saying that I’m exceptionally stubborn). And I can only imagine that sometimes, Jesus must laugh a little about how life would be so much easier if I would just let Him help me. Because isn’t it funny how God, the Creator of Heaven and Earth with the power to literally breathe and speak the world into being, tells us He has a plan for our lives, and yet we often reject it for our own intentions? I’ve been thinking about that a lot lately because I’ve been a little extra stubborn these past few months. I keep demanding my desires on my deadline, refusing to simply be still and listen. I’ve exchanged faith for fear, and I’ve traded peace for anxiety. I find comfort, though, in knowing that I’m not alone in this struggle. In fact, it reminds me a lot of the story of Sarah, Abraham’s wife. See, Sarah used to be Sarai. Sarai, like me, was a little too impatient and a little too self-reliant. She knew that God called her to have a son, but when it didn’t happen on her schedule, she took matters into her own hands. It’s easy for me to call Sarai out for being impatient and foolish. But if I’m being honest, I can think of a thousand times I’ve done the same thing. I constantly try to solve my problems on my own, and then I’m frustrated when my silly solutions blow up in my face. But then, there’s God. And what I love about God is that He can turn our mistakes into ministry and our messes into mercy. Genesis doesn’t stop at Sarai’s Sin. The real story starts there. God changes Sarai’s name to Sarah, and He changes Abram to Abraham. He promises to give them a son, who will ultimately fulfill God’s covenant for all of mankind! And even though my footnotes tell me the name change comes from some sort of lingual shift, I can’t help but notice that when the “I” is removed, God’s plan has room. When we take ourselves out of the equation, we allow God to be the solution. We allow Him to work in ways that glorify Him, which ultimately offer a better outcome than we can imagine. What I love even more, though, is that Sarah still isn’t perfect. When God tells them this good news, she laughs. And honestly, if I were almost 100 years old and God told me I was about to pop out a baby, I’d probably laugh too. And you know what the kid’s name is? Isaac. Which means “he laughs.” But this time the laughter is not out of disbelief but out of delight. Delight in knowing that our God is a God who can do the impossible and deliver us from our doubts. I find peace knowing that God helps us through our unbelief, if we are willing to ask for wisdom and faith. Absolutely nothing is too hard for the Lord. So my challenge is to drop the “I.” To drop the restless impatience and instead earnestly seek God’s plan. What happens next may not be what I expect, but it will be well worth my surprise. Here’s to the waiting, friends. Here’s to a God who can do much more than we give Him credit for. And here’s to a life filled with unknown adventures. Anyway, my tear-soaked face aside, these lyrics wreck me because they speak to my soul in the deepest way. And I’ve been running too fast and too far away to listen. As the end-of-semester stress approaches, I feel like the weight of my own expectations has knocked me facedown. I feel defeated. Exhausted. Heavy. Worn. Broken. Stressed. And most of all, I feel guilty for feeling that way. Friends, I am a die-hard perfectionist. If they had AA for perfectionism, I’d be the president. I like things to be exactly the way I expect and the way I plan, and even then, it’s usually still not good enough. It’s a toxic disease, perfectionism. People dress it up and turn it into “working hard” or “being thorough,” and sometimes it is. But a lot of times, it’s neither. It’s a sickness. And it frustrates me because I write about it a lot, but I never seem to fully learn my lesson. But tonight, I felt God begging me to just be still, stop being stubborn and open my heart to Him. To me, that song illustrates my struggle perfectly. I would die to reach perfection. I am practically killing myself now to achieve and to succeed. But Jesus doesn’t want nor need me to try to reach an impossible goal. All He wants is my broken heart. Jesus wants the heart that is battered and bruised. He wants the heart that bears scars from past mistakes and stretch marks from being pulled too hard. He wants the one that aches from the weight of Sin and our sadness. He wants the ugly one filled with shame, the gross one glued together with guilt. Jesus wants my heart even when I feel like it’s too broken to give Him. Even when all I can do is cry and say “help me,” Jesus still cares. And even when I fail tests, disobey Him and make messes, He still wants me. And His desire for us isn’t proven by what we do but by who He is. I’m done stressing about what Jesus already paid for. I would die to reach perfection, but that would never be enough. Instead, Jesus died so that His perfection would be more than enough. My broken, surrendered heart is all He wants. So is yours, friend. Humility. It’s an honored virtue in the Bible, in our churches and in our society, as it well should be. But for most of my life, I’ve bullied myself with false humility. I’ve transformed humility to hubris, which is not what God intended. All my life, I’ve never really felt “enough.” I think that’s pretty common in our world of social media comparison, impossible media standards and selfie culture. But in a way, I think I’ve always felt like that’s what you’re supposed to feel. I always thought that if you felt like you were enough, you were somehow sinning. It sounds crazy when I admit it, but I always thought embracing your gifts was a prideful thing to do. Listen to me, friends. That’s not humility. The other day, a speaker at my mentor group discussed our strength finders. And she said something that freed my heart from years of shame. She talked about how embracing our strengths doesn’t mean we aren’t humble, it’s the way God created us. Humility doesn’t mean hating yourself. It’s not that gut-punching feeling of “not-enough-ness” that crawls in your heart and whispers lies in your head. It’s not doubting your worth, and it’s certainly not denying your gifts. The Bible talks all the time about how God gave us each different gifts and abilities for a specific purpose. It talks about how we are made in God’s image and how we are so fearfully and wonderfully made. If all of that’s true, which I wholeheartedly believe, then how can I also doubt and deny my worth, my purpose, my identity? Arrogance is pretty easy to spot. We see it in people who only care about themselves, who boast about their abilities and who serve themselves above others. But I think there’s another type of arrogance that’s harder to admit and certainly harder to spot. It’s the essence of false humility that has captivated my life for so long. It’s those “you’re not good enough” thoughts that become so pervasive in our minds. It’s those lies of self-doubt that crowd our brains with trash instead of truth. And false humility is such a sad concept to me. False humility keeps us captive in our own minds, a prisoner of self-inflicted shame. False humility gives us a spirit of fear, which is such a loss to the world. False humility makes us fearful to do what we’re good at. It makes us not want to sing or dance or write or do whatever it is that God has called you to do. False humility leads to a tendency to hide our talents and avoid them so we aren’t considered prideful. But I think false humility basically is pride, sneakily wrapped in another destructive package. When I boast about myself, I’m focusing on me. I’m focusing on my efforts. When I doubt myself, I’m focusing on me. I’m focusing on my shortcomings. I’m focusing on myself instead of on God. I’m basing my worth on my own successes or failures, not in God’s words and in God’s presence. When I’m truly content and confident in my identity in Christ, I don’t have to doubt my own worth because I know it already. I think there’s a balance, friends. Being humble is not hiding. It’s OK to embrace your gifts. God didn’t give you talents so you could put them away and keep them to yourself. When you embrace your calling and your purpose, it doesn’t make you prideful. It makes you YOU. It makes you useful. It makes you the best version of you. I think that’s what humility is about. I think it’s realizing that we are all sinful, broken people who mess up every day and desperately need God. I think it’s about realizing that God designed us with special gifts for a special purpose that only we can do. I think it’s completely accepting that on our own, we’re a hot mess. But with God, He makes our messes His masterpiece, and he lets us be a part of this crazy, beautiful adventure called life. Humility is found when we surrender to Christ. It’s submitting ourselves daily to the one who made us so that we can accomplish His plans for His glory. You are so beautifully unique and special, friends. Embrace it. It’s OK to accept that God gave you special abilities. So let me ask you, friend. What are you good at? What are you passionate about? I think if all of us can accept that, God can do BIG things through it. Hey, friends. This past week felt like life was sucker punching me in the gut, and Sunday night, I finally hit rock bottom. But as rough as that sounds, I am so thankful for these times. Why? Because one of my most favorite things about Jesus is how He uses my breakdowns to give me breakthroughs. As I sat there, crying in my car in A WALMART PARKING LOT of all places, I realized that this is not the life God intended for me to live. If I’m being totally, completely honest with you guys, I haven’t been the best Alli I know I can be. I haven’t been giving people my full attention, and my Bible plans have been sporadic, at best. One of my strengths is positivity, and I LOVE encouraging people and making them feel valued, appreciated and loved. But lately, I have been walking around like a zombie, ignoring the people and things that give me joy. I haven’t worn makeup in weeks, I’ve been getting 2-3 hours of sleep a night and I haven’t been able to eat because when I get stressed, I lose all of my appetite. That’s kind of depressing, right? It’s not the kind of person I want to be, and it’s certainly not the kind of person a follower of Jesus looks like. We each have a story. And like every good story, each one is saturated in struggles. 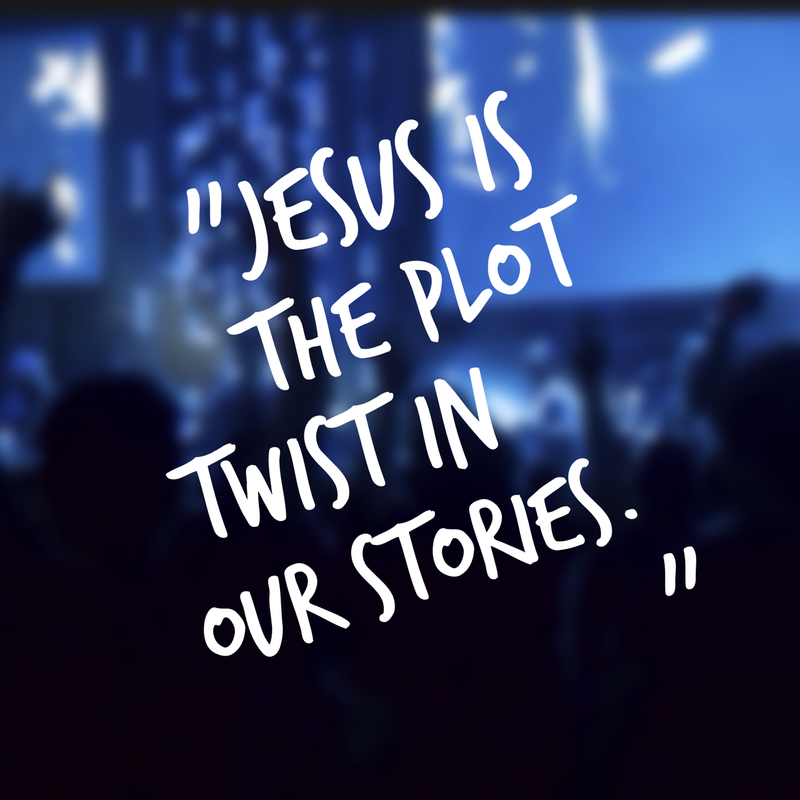 But our stories are never stuck because Jesus is the plot twist. So I’m finally ready to surrender my story. And it’s kind of scary to exchange your plans for God’s promises, but I promise you, friend, the freedom and peace is so SO worth it. But as I sat there in meltdown number 999, I knew God was shaking me, asking me to stop trying to earn his love and start accepting it. So this morning, I marched to the registrar’s office and dropped two classes. I’ve never done that before. But you know what? I feel like I can finally breathe again. But friends. That’s another one of my favorite things about God. As much as I want him to hand deliver His plans for me, it’s a joy to see every day as an adventure. Jesus goes on that journey with me each day, giving me ordinary days and ordinary people to create something extraordinary. No. It’s one of our first and favorite words, and it quickly becomes a parental nightmare. Toddlers, ordinarily adorable with their sweet smiles and cute voices, transform into tiny terrors as they scrunch up their little faces and yell “NO” with an explosive, albeit impressive gusto. I’m one of the worst culprits, friends. I HATE saying no to things. One of my biggest fears is disappointing people, so I avoid saying “no” at all costs. I convince myself that “it’ll all be OK” and “I can handle this,” so I keep taking on more. But the truth is, I say “yes” to so many things that I find myself overwhelmed, exhausted and defeated. Even though I may be doing a lot of good things, it means nothing if I’m not doing a lot of God things. Because the worst part is that sometimes when I’m saying yes to people, it means I’m saying no to God. And sometimes I wonder what my life would look like if I worried about pleasing God as much as I worried about pleasing people. As I evaluate my obsession with “yes,” I feel a little ashamed because I find the root of it all – my pride. When someone asks me for help, it makes me feel needed and necessary. It gives me a purpose, and it makes me feel validated. And when I always say “yes,” I convince myself I’m being a good friend, a good student, a good worker, etc. Do you see what’s glaringly wrong about that? When I say “yes” to all these things, I’m telling myself I’m doing it for someone else’s benefit, but really, I’m doing it for my own. When I say “yes,” sometimes I’m not doing it because I love that person…I’m doing it because I want them to love me. When I say “yes,” I’m using their acknowledgment for my affirmation, which is the surest path to destruction. The problem is, my worth isn’t found in my works. It’s not tucked away in life’s “yeses” waiting for me to earn it. My worth is waiting in the love letter Christ wrote to me. And when I read His Word, I find it. Your self-esteem isn’t rooted in what you do, friends. It’s rooted in who you are – which is a hand-crafted, perfectly unique treasure designed by God. You don’t need someone to say “Good Job.” You don’t need that extra accomplishment. You don’t need to be busy to be loved. Sometimes, the best thing we can do is say “No.” Because when we find strength in the stillness, we can find clarity in our purpose. If I’ve learned anything this summer, it’s that at Life Church, “we give up things we love for things we love even more.” Sometimes we have to say “no” to good things to say “yes” to the God ones, and those “yeses” will ultimately make us happier, healthier and whole. Happy Sunday, friends! Sundays are my absolute favorite days because I get to love on the world’s cutest two-year-olds and hear another amazing message at my church that reminds me of the depths of my Father’s love for me. So yeah, Sundays kind of rock. After church today, I came to my favorite coffee shop in Stillwater – Aspen Coffee. I love coming here because the baristas are so friendly, the playlist is second to none and the atmosphere (do I sound hipster yet??) is on point. As I sit here in one of my favorite places, I can’t help but be so immensely thankful for everything God has done in my life. You know, too often, I don’t take time to simply be grateful. And I should. As I was reading through my prayer journal (I get too easily distracted to pray in my head, so I like to journal my prayers), I noticed how much of it was me asking God for things. And although I always need to ask God for things, I also need to be thankful for everything He has already given me. Looking back, I realize just how many signs of His affection I ignore because of my sinful, human heart. Too often, when I pray, I feel like God isn’t listening or present, when I’m the one who’s running away. I get so impatient in the waiting, and I insult God with my lack of faith. So I’ve never heard God directly speak to me before. But I have seen Him at work in me and in my life; it just takes time to realize it. But when I toured Oklahoma State, I met a professor named Dr. Spurrier. Dr. Spurrier was a special kind of person, one with kind eyes and a presence that made you feel like he’d known you your whole life. It was his encouragement that assured me OSU was the right choice. I didn’t realize it at the time, but Dr. Spurrier was God’s way of answering my prayer. I think God likes to surprise us like that. He uses ordinary, flawed people like ourselves to create a beautiful story. And like any great story, there’s a lot of conflict. There’s a lot of struggles. And there’s a lot of wrong turns. But in the end, it’s a story overflowing with grace, and it’s a story ending in triumph. As I came to OSU, I was still nervous about being so introverted. (I am a proud INFJ personality type) But God came through again by surrounding me with a community of people through a student organization called FRC. Then, through FRC, I met my best friend, Ciera, who led me to Life Church, where I have met the most genuine, kind people and found my worth and identity in Jesus. Now, I have the awesome opportunity to intern with Life Church this summer not because I’m good but because God is good. And without Him, I could do nothing. God doesn’t need me at all. But God wants me. And he designed me for some purpose that I’m still figuring out, and I think that’s beautiful. I used to beg God for answers. I don’t like the whole concept of not being control because I’m one of the biggest control freaks you’ll ever meet. But now, I’m pretty thankful God surprises me. I’m thankful I don’t know all the answers because I get the opportunity to follow Him in places I never dreamed. You know, I think God likes to take us to the end of our comfort zone and give us a choice whether to stay there or follow Him further. And I want to keep following. As I reflect on a few of the many blessings God has given me, I am overwhelmed by his unwavering love, forgiveness and grace through it all. No matter what your story is, we have so much to be thankful for, friends. I have a roof over my head, love overflowing in my heart, and the freedom to worship my God without fear of persecution. God is so present and interwoven in our lives, and I hope I stop to be still and praise Him for it. Sending you so much love from this beautiful place I call my home in Stillwater, Oklahoma. PS: Sorry it’s been five billion years since I’ve written. Also, to be completely honest, I wrote this weeks ago but I get really nervous about posting so, ya know.